I have found that this form of facilitation is most powerful when used during conversations that have no predetermined end point apart from an alignment of the individuals present. This is because the images themselves become a structure for what had been discussed already and suggest potential topics for continuing the conversation. I have been facilitating using graphics for several years note and over that time I have discovered five principles that have helped me. It can often help to learn more about the topic before the conversation where possible as this can provide useful insight. This research can be done in a number of ways including reading relevant material or taking with the participants before hand. This isn’t always essential from a capture perspective but will help you to engage with the conversation and improve the end result. Emotion is the critical component to creating a visual that facilitates a conversation. It is important to understand the topics that are creating the emotion in the conversation as these are the ones that need most guidance. Listen carefully to the conversation and keep your ear open for key points of debate. This is often easier when you know the topic being discussed but if you don’t the group can be used for guidance, consider their response as points are raised. you need to distil the essence of a message into a word or a short statement. These keywords help you to construct a map of the conversation that you can create imagery around. Writing is an important part of any graphic facilitators tool kit and as such it is essential to practice your style. Remember it should be readable and quick as well as look good so think about it from another perspective. Group common topics together, consider how they connect with each other. The important thing here is to ensure that relationships are clearly illustrated. This can be done through the use of boxes, clouds, arrows, lines and even scale. Depending on your medium it can be hard to rearrange so think about your layout before you start, considering where you want to leave room and what you want to be focused on is critical at all stages. 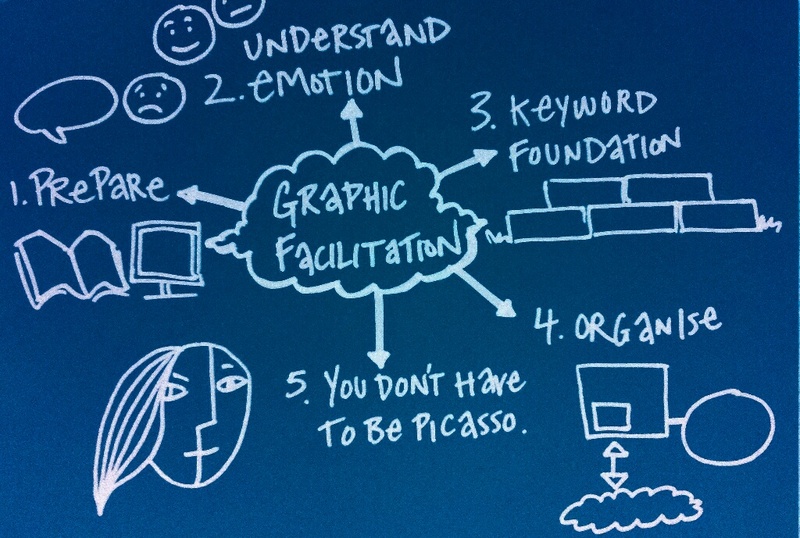 To use graphic facilitation does not require you to be an amazing artist or illustrator. I’m not saying that the end product won’t look amazing if you are, I’m saying that to share its meaning a picture doesn’t have to be a work of art. Any imagery can be simplified down to icons using basic shapes such as circles, triangles and rectangles. Use these to construct icons that represent the pictures you are thinking of when you hear the keywords. Do you have any advice you’d like to share?